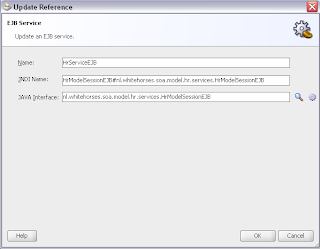 Enriching your data with the Oracle ESB or with the Mediator component in SOA Suite 11g can be hard. 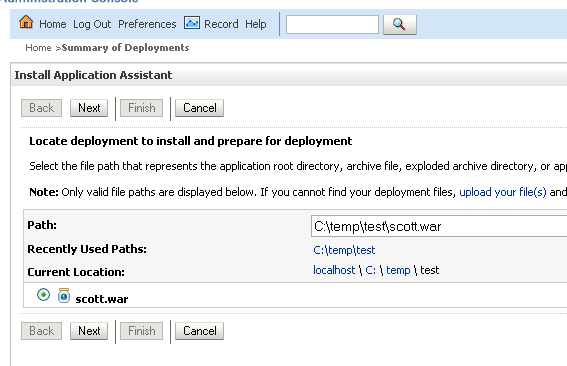 It works perfectly in a one-way ( fire and forget ) situation, like described in this AMIS guide. With the Patch Set 2 of SOA Suite 11g R1 there is a new supported SOA Suite Component called Spring Component which can do this trick perfectly and no limitations. In this blogpost you will see how easy it is to use Java in the Spring Component, how you can wire this Component to other Components, Services or References adapters. And off course there is no limition in how many times you can enrich or change the data in the Spring Component. 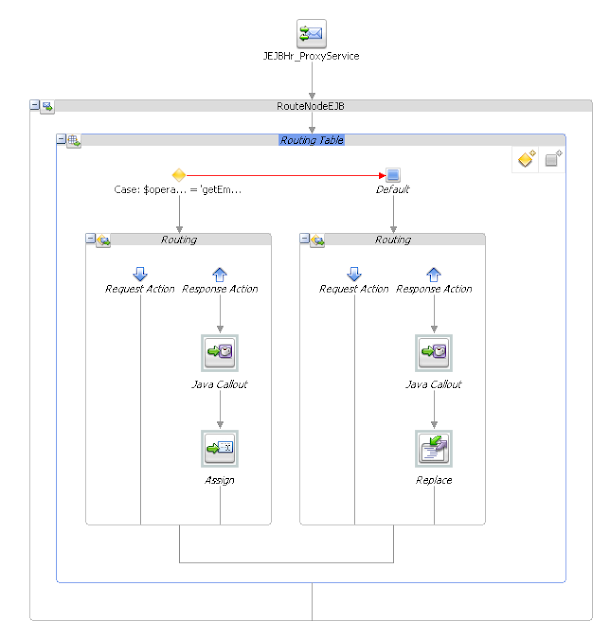 For this example you need an EJB Session Bean and the Employee and Department JPA Entitiy ( Based on the HR demo Schema ). This EJB Session Bean is also exposed as a Web Service. The HrReference adapter calls the EJB Session Bean interface and the HrWSReference adapter calls the Web Service Interface of this Session Bean. This Model project is included in the example workspace. 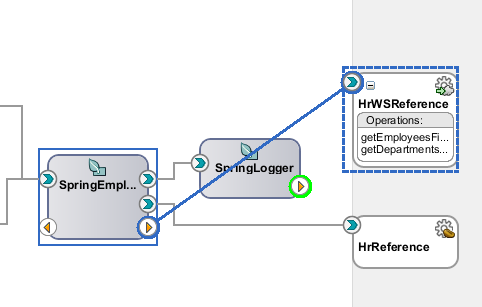 Let's start easy with the SpringLogger Spring component. This component will only do a System out. 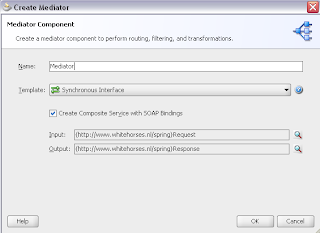 Drop a Spring Component on the composite xml. This create a empty Spring Context XML. Because the plan is to call this component from a other component you need to create a Service interface. For this component this means you need to create a Java Interface class. 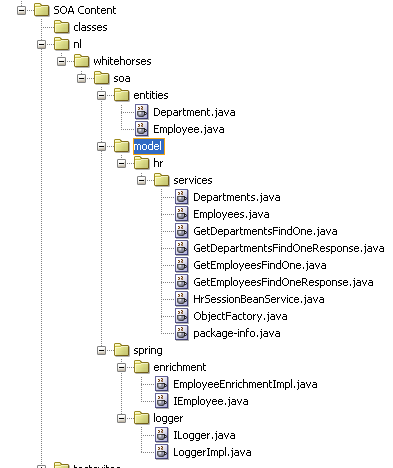 Add a service to the SpringLogger Component, this service has the java interface as type. And you can add this implementation to the SpringLogger Component, The target attribute of the service references to the name of this bean. This spring component is finished and you can work on the Employee Spring Component which will do the enriching and forwarding of the data. Before you can start with the java interface or implementation, you need to make some entities which will be used in this interface. The employee entity with the department attribute. You can now use the employee entity in the java interface class. This interface will be used in the Spring Component Service. The Service has employeeId as parameter and will return the employee entity. And the implementation. In the enrichEmployee method you will do all the enrichment and forwarding. We will continuous change this method when we wire all the reference adapters. Drop a new Spring Component to the Composite, add a Service and a Bean based on these java classes in the Spring Context XML. 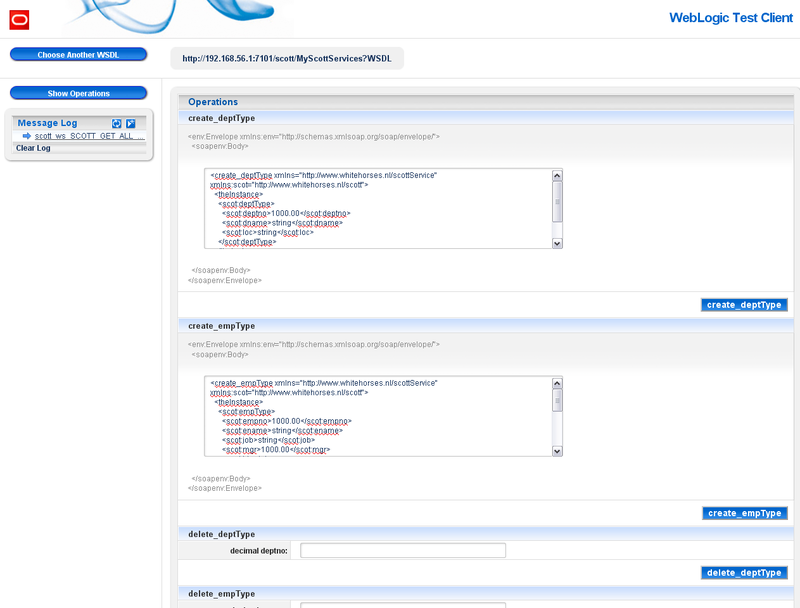 Wire the reference of the SpringEmployeeEnrichment Component to the service of the SpringLogger Component. 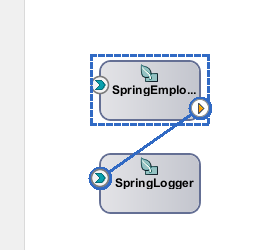 JDeveloper will add a reference in the SpringEmployeeEnrichment Spring Context to the SpringLogger Component. This reference need to be injected to the EmployeeEnrichmentImpl class. Add a property to the bean with a reference to the SpringLogger service. 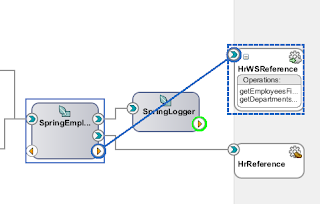 Add the loggerReference variable ( use the ILogger interface and this must match with the property name of the Spring Bean ) to EmployeeEnrichmentImpl and generate the Accessors. Spring will inject the ILoggerImpl to this variable. In the enrichEmployee method you can call the log method and pass on the parameters. The next step is to expose the Service of the Spring Component. Drag the service to the Exposed Services part of the composite. So you can invoke this service. 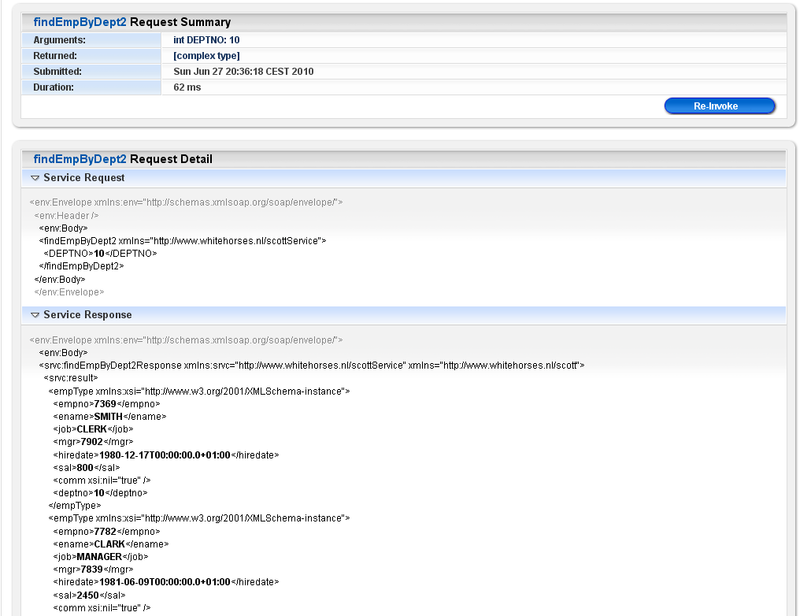 You can now choose to expose this as an EJB or a Web Service. 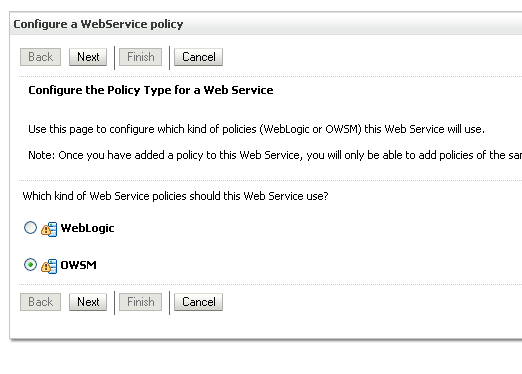 Choose Web Service so you can invoke this service in the Enterprise manager. 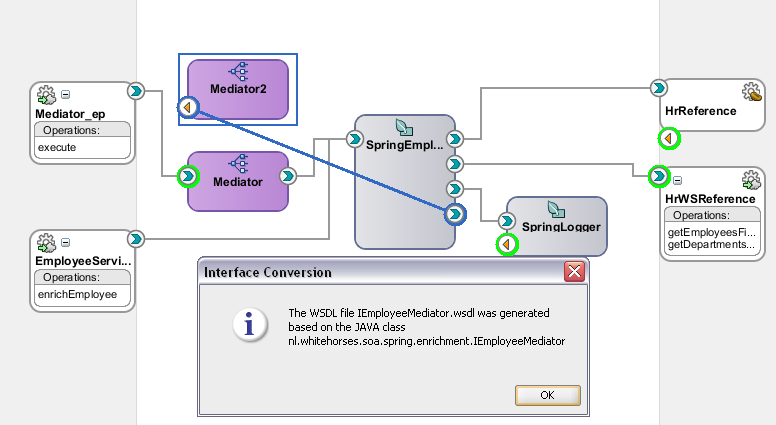 This is not the best way to expose this Spring Component Service, every change in the java interface will lead to a different WSDL, so let's add a Mediator with an Employee XML Schema to solve this. Now you can change the WSDL or the Java Interface of the Spring Service and only need to update the transformation in the routing rule of the Mediator. Now we can return to the Enrichment part by adding a EJB and Web Service reference adapter and wire this to the Spring component. First we use the EJB adapter to lookup the employee. 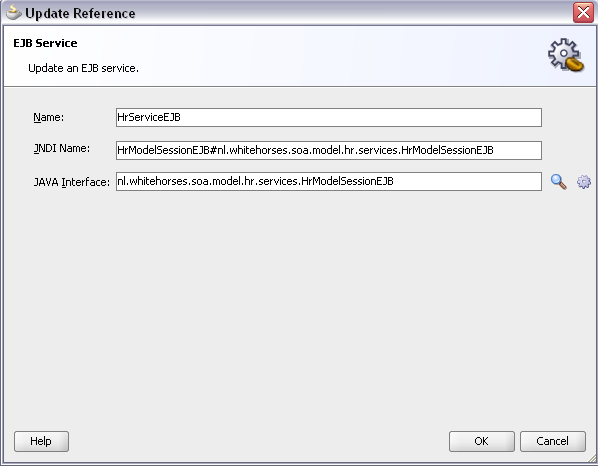 You need to change the Implementation by adding a variable based on the Remote Interface of the EJB Session Bean. 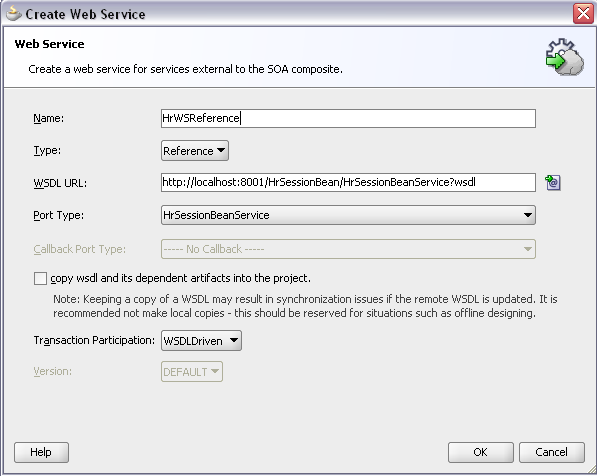 Add the Service Interface jar of the EJB Session Bean to the dependency of the SOA Project and also put it in the SCA-INF/lib folder. The enrichEmployee method will invoke this EJB and converts the result to a local employee entity. Add a new Spring Context Reference based on this Remote interface of the EJB Session Bean. Also add a new property to the Spring Bean which matches with the variable in the Implementation. Add a new wire for the EJB Reference Adapter by Dragging the not used reference of the Spring Component to the external references of the Composite. The EJB Reference Adapter is finished and wired to the Spring Component. 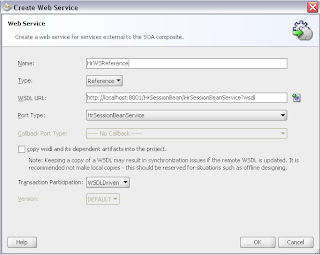 Add a Web Service Reference Adapter to your Composite. Wire the WS to the Spring Component Reference. 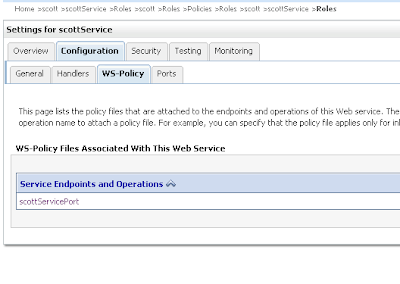 JDeveloper will generate a WS proxy client and add a Reference to the Spring Context. And add a property to this reference on the Spring Context bean. 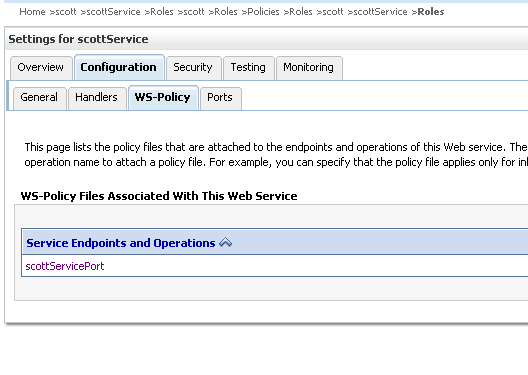 Change the Spring Component implementation so you can invoke the Web Service to lookup the department. 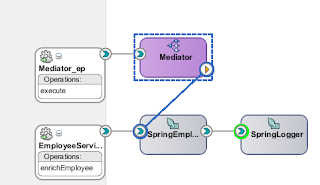 The last part is to connect a Mediator to the Spring Component and pass on the Employee entity so you can for example write this object to a file or insert the employee in a table. 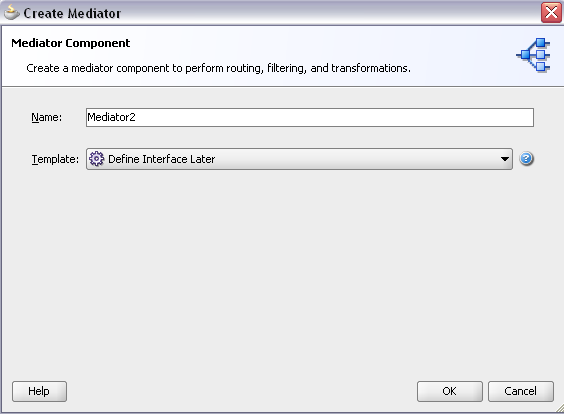 Add a Mediator Component to the Composite and use the Define Interface Later Template. 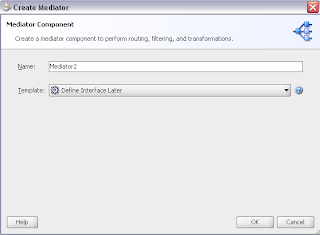 Create a new Java Interface for this Mediator with the entity you want to pass on. 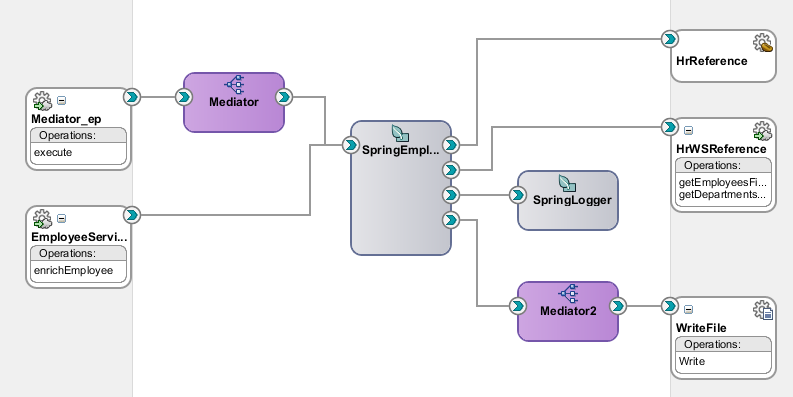 Add a wire between the not used reference of the Spring Component and the service of the Mediator. 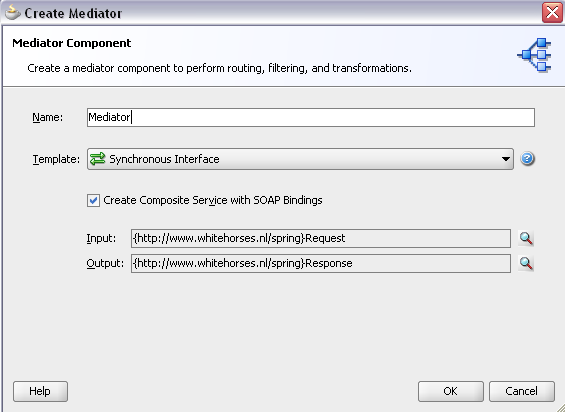 At last add a File or a Database Adapter to the Composite and wire this to this Mediator. Here is the example workspace. With the JEJB Transport you are able to pass POJO's through an OSB Proxy or Business Service( for the outside world it behaves like a remote EJB). JEJB Transport works like the EJB Transport but the request and response objects are not translated to XML so you can't use XQuery etc. To make things not too hard, OSB 11g makes a XML presentation of the request method and its parameters, which you can use in the Proxy Service. Returning a java response message can be easy and difficult. The easy way is to use the same Java Interface in the Proxy and Business Service, then you don't have to do anything ( the BS will pass the result POJO to the Proxy, which returns it to the EJB client). 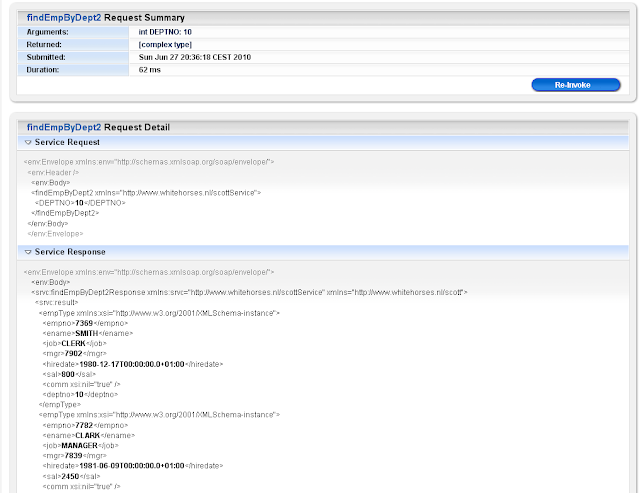 This can be handy for logging the requests or use the OSB server as an EJB proxy. An other use case can be, that you want to manipulate the response ( Enrichment ) or want to replace the EJB by Web Services. Thne you don't need to change the Applications which uses these remote EJB's. In this blogpost I will show you how you can achieve this with a Java CallOut in the response pipeline. Here is an example of a JEJB response. Before I start you need to know the basics about the EJB and JEJB Transport so please read my previous blogpost and then continue. This is a overview picture what I will do in this blogpost. It starts with the EJB client which looks up the Remote EJB of the Proxy Service and calls the getEmployeesFindByKey and getEmployeesFindAll method. 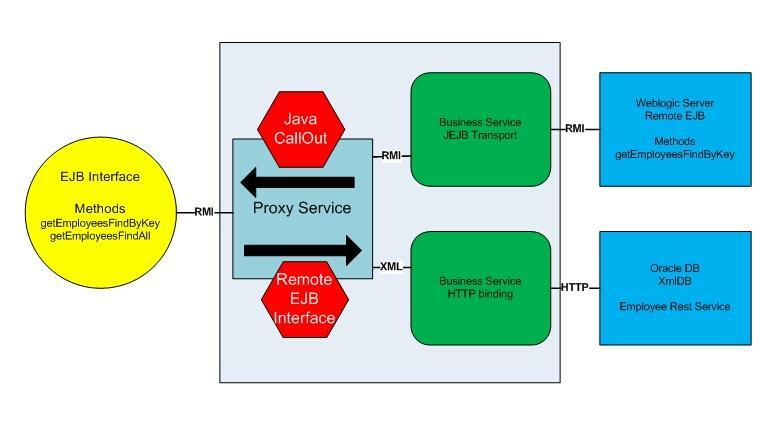 The Proxy Service has a JEJB Transport with a Remote Interface and has a Routing Table for the two interface methods. In case of the getEmployeesFindAll method the Proxy calls a HTTP Business service and with the getEmployeesFindByKey method it calls a JEJB Business Service. The HTTP Business Service call a Rest Service on the Oracle XmlDB which returns all the employees in XML. 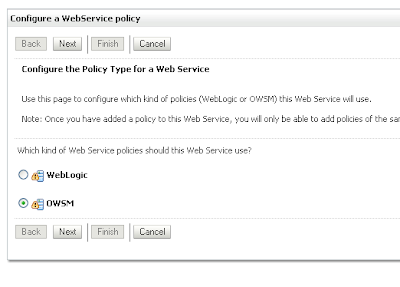 The JEJB Business Service call a remote EJB on a Weblogic Server this returns an Employee Entity. Here is the Message Flow of the Proxy Service. The Routing Table reads the operation variable. This is the Java Class with the static method which will be used in the Java CallOut. I will be using the static employeeReference method. This method has 3 parameters, the first operation parameter is important to determine what kind of conversion I need to do. The Direction parameter is used for logging and the body parameter contains the response of the Business Service. This will be converted to Employee Entities. For XML to Java I will be using JAXB. First Import the Java CallOut jar into your OSB Project. This must contain the Class with the static method and the Employee Entity. Lets start with the easy one ( the getEmployeesFindByKey method) by adding a Java CallOut to the response pipeline. Use the $operation variable for the operation parameter and the ctx:java-content element for the body parameter.The return of the method will be copied to the $result variable. Because of the JEJB Business Service ( returns the right body content ) I only need to replace the original java content with the result variable. The getEmployeesFindAll method is a bit different because it uses the HTTP Business Service which returns a body which is not compatible with the JEJB Trasnport. So the body parameter of the Java CallOut has a different expression which matches with the response of the HTTP Business Service. That's all and now you can lookup the Remote EJB on the OSB Server and call one of the available methods.